This is a hardcover that is slightly oversized and feels incredibly chunky. You are getting a lot of pages for your money. It begins with The Cape: 1969 which is the prelude to the main feature and although explains a bit of backstory isn’t necessary to the original. 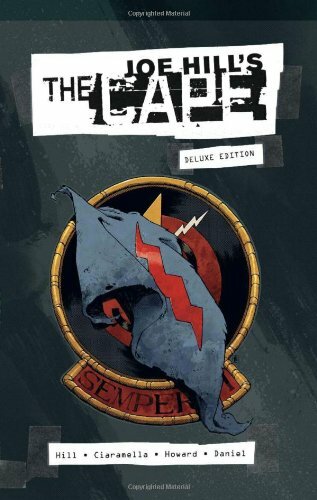 The Cape is an unusual tale that really doesn’t fit in the superhero genre. It is based on a Joe Hill (Stephen King’s son) short story but expands it significantly. There is a very sturdy hardcover and the format feels just a tad oversized. The spine allows the book to lay flat when open which is always appreciated. The cover is cleverly overprinted giving the illusion that the titles and pictures are stuck on with clear sticky-tape. You find yourself picking at it to make sure it isn’t. There is a complete cover gallery but no other art. There is also the complete text of the original short story with the adaptor’s notes about what to cut and to leave in which is actually an interesting comparison. This entry was posted in Graphic Novel and tagged Jason Ciaramella, Thumbs Up! by 365gn. Bookmark the permalink.